Take the Shiga Quiz and see how much you know about Shiga Prefecture! Shiga Quiz has 100 wide-ranging questions covering Shiga’s culture, history, historical figures, art, and major sights and products. It’s a long quiz that may require 45 min. or longer to complete. However, there’s no time limit to finish the quiz. You will see 25 questions per page. After answering 25 questions, click on “Continue” at the page bottom to see the next page. If you don’t see the “Continue” button, it means you have not answered all the questions. Scroll backward to answer any unanswered questions. A few questions have many answers (as many as 20!) to choose from. On older browsers, the questions might not be displayed in the proper order. This quiz requires no registration and no fees. You shall remain anonymous and no personal data about you will be collected. Quiz authored by Philbert Ono. 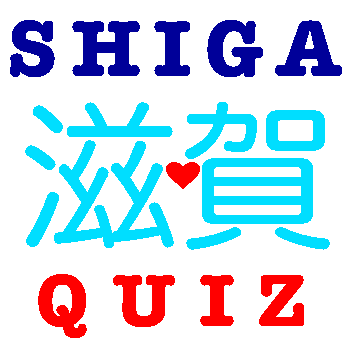 There is also the shorter and easier Shiga Image Quiz with 50 questions. home of Shiga Kogen Highland resort. where the Shiga toxin was discovered. a ski resort in Nagano, Japan. one of the 47 prefectures of Japan. Shiga Prefecture is on ________ island. a large lake near the middle of Japan. Chikubushima, a sacred island in northern Shiga. Mt. Hiei, one of Japan's most sacred mountains. Mt. Ibuki, one of Japan's 100 famous mountains. Lake Yogo, a pretty lake in northern Shiga. Gifu, famous for cormorant fishing on Nagara River. Kyoto, famous for Buddhist temples and Shinto shrines. Mie, home of Ise Jingu Grand Shrines. Nara, home of the Great Buddha at Todaiji temple. Shiga Prefecture is in the _______ Region of Japan. Lake Biwa, Japan's largest lake. Enryakuji Temple, headquarters of the Tendai Buddhist sect. Azuchi Castle in Azuchi, Omi-Hachiman. What is Shiga's old name? JR Maibara Station or JR Kyoto Station. JR Nagahama Station or JR Otsu Station. The Koka/Koga ninja was from where in Shiga? indicates a crosswalk in a school zone. reminds children to run to school so they won't be tardy. points the way to the nearest children's playground. cautions drivers to watch out for kids who may suddenly dart out on the street (chasing after a ball, etc.). encourages children to run and exercise regularly to be healthy. A sibling of Hello Kitty. A white rabbit with horn-like ears. A white beckoning cat (maneki-neko) wearing a red samurai helmet with gold horns. A cat with bull horns. a pet shop specializing in birds. a chain of pachinko parlors. a local chain of supermarkets and department stores. One of the world's oldest lakes formed 4 million years ago. Named after the Biwa lute. Home to 17 endemic fish and 30 mollusk species and subspecies found nowhere else. Covers one-sixth the total area of Shiga. Water surface area (669.23 sq. km) is larger than Tokyo's 23 wards (626.7 sq. km). 235 km (146 mi.) of shoreline. Takes 3 days to bicycle completely around. About the same distance as going from Otsu to Hamamatsu (Shizuoka). Surrounded by mountains, Lake Biwa is like a giant bowl collecting water from 118 inflowing rivers. Seta River in Otsu is the only outflowing river. Water supply for 14 million people in the Kyoto and Osaka area via the Lake Biwa Canal. A major scuba diving spot. Has white-sand beaches like at Omi-Maiko. Has about 23 attached lakes that are smaller bodies of water connected to Lake Biwa. Inspired artists like Hiroshige ("Eight Views of Omi") and Oguchi Taro who composed "Biwako Shuko no Uta" (Lake Biwa Rowing Song). Lake Biwa Museum in Kusatsu is the best place to learn all about the lake (in English). Shiga's geographical areas are named according to their direction around the lake. Kohoku (northern Shiga 湖北), Koto (eastern Shiga 湖東), Konan (southern Shiga 湖南), and Kosei (western Shiga 湖西). Ukimido Floating Temple (Mangetsuji) on the lake in Otsu. Shirahige Shrine's torii in the water off Takashima. Chikubushima island in Nagahama seen from Kaizu-Osaki in Takashima. View from Mt. Shizugatake in Nagahama. View from Mt. Hiei in Otsu. View of Chikubushima and Mt. Ibuki from Imazu in Takashima. Kaizu-Osaki cherry blossoms in Takashima. Biwako Ohashi Bridge between Moriyama and Katata in Otsu. One of Japan's three great shrines dedicated to Benzaiten (Benten), the goddess of music, water, and anything that flows, is where in Shiga? Hiyoshi Taisha Shrine in Otsu. Ukimido Floating Temple in Otsu. Cycling around Lake Biwa is popularly called "Biwa-ichi" in Japanese. An abbreviation for "Biwako Isshu" (琵琶湖一周), meaning "going around Lake Biwa." Bicycles can be rented at major hotels and many train stations in Shiga. High-end bicycles can be rented at Maibara Station (Biwako Isshu Rental Cycle) and Lake Biwa Marriott Hotel (GIANT STORE Biwako-Moriyama) in Moriyama. The cycling route around Lake Biwa is flat except for northern Nagahama (Oku Biwako Parkway or Route 512 and Route 303). Marked with banners, "Biwaichi Cycle Stations" at convenience stores, etc., may provide restrooms, food and drinks, tire pumps, and a courier service to ship your bicycle home. Crossing the Biwako Ohashi Bridge between Moriyama and Katata is a short cut to cycle around the lake. Otherwise, go on the longer route around the South Basin (Otsu). Bike paths on regular roads are marked with blue arrowheads (nationwide in Japan). Dedicated bike paths may have red pavement. Pedestrians and cyclists may share the same path. Many rental bicycle shops allow you to ride and return the bicycle to another rental shop (usually along the same train line). Mt. Hakodate in Imazu, Takashima. Mt. Hiei in Otsu (and Kyoto). Mt. Mikami (nicknamed Omi-Fuji due to its conical shape). Shiga has 22 buildings that are National Treasures. Among the 47 prefectures, this is the ____ highest number of National Treasure buildings in Japan. Which castle in Shiga is a National Treasure? Nagahama Castle in central Nagahama. Odani Castle In northern Nagahama. Chojuji's main hall in Konan. Enryakuji Temple's Konpon Chudo main hall in Otsu. Kannondo Temple's Karamon Gate in Nagahama (Chikubushima). Ishiyama-dera's Tahoto pagoda in Otsu. Jorakuji's main hall and pagoda in Konan. Kongorinji's main hall in Aisho. Miidera's Kondo main hall in Otsu. Saimyoji's main hall (and pagoda) in Kora. Zensuiji's main hall in Konan. Hiyoshi Taisha Shrine's Higashi Hongu Honden Hall in Otsu. Hiyoshi Taisha Shrine's Nishi Hongu Honden Hall in Otsu. Namura Shrine's Nishi Honden hall (center) in Ryuo. Taga Taisha Shrine in Taga. Tsukubusuma Shrine in Nagahama (Chikubushima). Which garden or park in Shiga is this? Bunka Zone Garden in Otsu. Hokoen Park in Nagahama (plum blossoms). Hyozu Taisha Shrine's garden in Yasu. Jizogawa River in Samegai, Maibara. Mizunomori Aquatic Plant Park in Kusatsu (water lilies). Nagisa Park in Moriyama (rapeseed blossoms). Shakunage Gorge in Hino (Rhododendron). Zeze Castle Park in Otsu. JR Aburahi Station based on a ninja design on the JR Kusatsu Line in Koka. Old Biwako Hotel, now the Biwako Otsu-kan in Otsu. Gansan Daishi or Gyokusenji, a Buddhist temple of the Tendai Sect in Torahime, Nagahama. Hiyoshi Toshogu in Otsu, the inspiration for the more famous Toshogu Shrine in Nikko. Lake Biwa Canal Aqueduct with water flowing from Lake Biwa to Kyoto. Namura Shrine's Romon Gate in Ryuo, Shiga. Important Cultural Property. JR Notogawa Station in Higashi-Omi. Sagawa Art Museum in Moriyama based on a Shinto shrine design. Toyosato Elementary School in Toyosato. Keiunkan, a former guesthouse originally built in 1887 to accommodate Emperor Meiji when he visited Nagahama. Tsuchiyama-juku Honjin lodge in Koka. Former residence of William Merrell Vories and wife Makiko in Omi-Hachiman. Former home of Omi merchant Tonomura Shigeru (外村 繁邸) in Gokasho, Higashi-Omi. Gokasho Kondo Omi merchant homes in Higashi-Omi. Hachiman-bori Canal area in Omi-Hachiman. Harie district in Takashima with natural spring water supplying homes. Sakamoto, temple town at the foot of Mt. Hiei in Otsu. Samegai-juku former lodging town on the Nakasendo Road in Maibara. Sugaura, lakeside village in Nagahama. Suigo reed-lined waterways in Omi-Hachiman. ayu sweetfish from Lake Biwa (tempura). Biwa (masu) salmon from Lake Biwa. red devil's tongue (aka konnyaku). Omi-cha tea grown in Tsuchiyama, Koka. noppei udon in Nagahama (big mushroom on udon noodles). yaki-saba somen in Nagahama (mackerel on somen noodles). Salad Roll (sarada-pan) made in Kinomoto, Nagahama. ubaga mochi made in Kusatsu. Adoberry confections made in Adogawa, Takashima. Adoberry is similar to boysenberry. Club Harie's baumkuchen cake (Club Harie photo). Monaka confection (wafer sandwich with sweet adzuki) from Taneya. Funazushi Pie cookies made in Moriyama. ito-kiri mochi made in Taga. UCC canned coffee (with screw-on caps) made in Echigawa. sake rice wine (many brands in Shiga). yahei hot chili peppers (super hot!) grown in Konan. Bin-temari threaded balls made in Aisho. Hikone butsudan (Buddhist altars) made in Hikone and Maibara. Shigaraki-yaki pottery made in Shigaraki, Koka. Omi-jofu hemp fabrics made in Echigawa, Aisho. Hama chirimen silk fabrics made in Nagahama. Yoshibue reed flutes made in Omi-Hachiman and Takashima. Unpei-fude (雲平筆) calligraphy brushes made in Takashima. Takashima folding fan ribs (senkotsu) made in Takashima. Natural indigo-dyed fabrics in Konan. Beckoning cat (maneki neko) dolls. Die-cut postcards from post offices in Shiga ("gotochi form cards"). Shiga postage stamps sold at post offices in Shiga. Omi fans (made with Takashima bamboo ribs). Tanuki (raccoon dog) statue (all sizes) from Shigaraki. Wooden prayer tablets (ema) from Shiga shrines or temples. In the famous Man'yoshu (万葉集) poetry collection from the 8th century, a poem mentions Lake Biwa pearls as "shiratama" ("white balls"), used as a metaphor for women (Book 11, Poem 2445). Saltwater pearls are produced by oysters, while freshwater pearls come from mussels. The Lake Biwa pearl mussel (Hyriopsis schlegelii イケチョウガイ), endemic to Lake Biwa, was found to be best suited for freshwater pearl cultivation. It takes three years for the Lake Biwa pearl mussel to grow large enough to produce pearls. Then it takes another three years for the mussel to produce pearls. The main difference between freshwater Lake Biwa pearls and saltwater pearls (like Mikimoto) is that Lake Biwa pearls have thicker pearly layers, making it more lustrous. Today, many Lake Biwa pearl farmers cultivate freshwater pearls for a worldwide market. Aeon Mall Kusatsu in Kusatsu. Mitsui Outlet Park in Ryuo. Mondecool next to Nagahama Station. Viva City in Minami Hikone. Yume-Kyobashi Castle Road and Yobancho Square near Hikone Castle. Omi Jingu Shrine in Otsu. Lake Biwa Canal in Otsu. Omi-Fuji Karyoku Park in Yasu. Mt. Toragozen in Torahime, Nagahama. Which float festival in Shiga is a UNESCO Intangible Cultural Heritage? Nagahama Hikiyama Matsuri in central Nagahama held annually on April 14–16. Minakuchi Hikiyama Matsuri in Minakuchi, Koka held annually on April 19–20. Hino Matsuri in Hino held annually on May 2–3. Omizo Matsuri in Takashima held annually on May 3–4. Nyu Chawan Matsuri in Nagahama (Yogo) held in spring once every several years. Otsu Matsuri in Otsu held annually on the weekend before the second Monday of October. Maihara Hikiyama Matsuri in Maibara held annually on the three-day weekend in Oct. around the 10th (Sports Day, a national holiday). Katsube Shrine Fire Festival in Moriyama held annually on second Sat. of January. They burn giant straw torches. Sagicho Matsuri in Omi-Hachiman held annually on a weekend in mid-March. They burn floats made of edible materials. Hachiman Matsuri in Omi-Hachiman held annually on April 14–15. Giant torches of rice straw are lit up. Yuge Fire Festival in Ryuo held annually on May 1. Misaki Shrine Fire Festival in Aisho held annually on May 4. They burn a 5-meter pile of bamboo. Shinoda Fireworks held annually on May 4 at Shinoda Shrine in Omi-Hachiman. Shigaraki Fire Festival in Koka held annually on fourth Sat. in July nearest to the 23rd. Procession of torch bearers. Hifuri Matsuri in Hino held annually on August 14–15. They toss up torches on a tree that doesn't burn. Sanno-sai Festival in Otsu held annually on April 12–14. Kaizu Rikishi Matsuri in Takashima held annually on April 29. Iba Saka-kudashi Festival going down a steep mountain in Higashi-Omi held annually on May 4. Hyozu Matsuri in Yasu held annually on May 5. Taga Taisha Lantern Festival in Taga held annually on Aug. 3–5. Takebe Taisha Senko-sai in Otsu held annually on August 17. Kenketo Matsuri and Odori (National Intangible Folk Cultural Property) held annually in Tsuchiyama, Koka on May 3. Kenketo Matsuri Festival in Ryuo held annually on May 3. Naginata Odori Matsuri in Moriyama held annually on May 5. Shotoku Matsuri (Goshu Ondo dance) in Higashi-Omi (Yokaichi) held annually in late July. Hinade Shrine Sumo Odori dance in Maibara held annually on the third Monday of September. Suijo Hachiman Shrine Taiko Drum Dance in Maibara held every five years in September (next one in 2019). Asahi Honen Taiko Drum Dance in Maibara held annually on October 4. Mascot Character Festival in Hikone held annually near Hikone Castle in mid-Oct.
Ibuki-yama Taiko Drum Dance in Maibara held every five years in October (next one in 2020). Yuki Saiden rice paddy in Yasu near Mikami Shrine on the fourth Sunday in May. Taga Taisha Shrine in Taga on the first Sunday in June. Yanmar Museum roof in Nagahama. Tsuchiyama Saio Princess Procession in Koka held annually on the last Sunday in March. Minami Sanno Matsuri in Hino held annually on April 4. Kusatsu Shukuba Festival in Kusatsu held annually on April 28–29. Sakata Shinmeigu Yakko-buri Samurai Laborers' Procession in Maibara held annually on April 29. Aburahi Matsuri Festival in Koka held every five years on May 1 (next time in 2021). Shichikawa Matsuri Festival in Takashima held annually on May 4. Azuchi Nobunaga Festival in Omi-Hachiman (Azuchi) held annually on the first Sunday in June. Hikone Castle Festival Parade held annually on November 3 (national holiday). Hokoku Shrine Toka Ebisu in Nagahama held annually on January 10. Taga Matsuri in Taga held annually on April 22. Shichikawa Matsuri in Takashima held annually on May 4. Namura Shrine Sekku Matsuri in Ryuo held annually on May 5. Omi Jingu Shrine Yabusame Horseback Archery in Otsu held annually on the first Sunday in June. Amenomori Hoshu-an museum in Takatsuki, Nagahama. Azai Folk History Museum in Nagahama. Azuchi Castle Archaelogical Museum in Azuchi, Omi-Hachiman. Biwako Shuko no Uta Shiryokan song museum (Lake Biwa Rowing Song) in Imazu, Takashima. Dotaku (Bronze Bell) Museum in Yasu. Ishibe Shukuba no Sato outdoor museum and Tokaido History Museum in Konan. Koka Ninja Museum in Koka Ninja Village (甲賀忍術博物館). Lake Biwa Museum in Kusatsu. Maruko-bune Museum (Maruko-bune no Yakata) in northern Nagahama (丸子船の館). Minakuchi Folk History Museum in Koka (水口歴史民俗資料館). Nagahama Railway Museum near JR Nagahama Station (長浜鉄道スクエア). Ohmi Merchant Museum in Higashi-Omi (近江商人博物館). Otsu City Museum of History. Tokaido Tenmakan Museum in Tsuchiyama, Koka. Tsuchiyama Folk History Museum in Koka. Yanmar Museum in Takatsuki, Nagahama. House of Nobunaga (Nobunaga no Yakata) in Omi-Hachiman. Miho Museum in Koka (Shigaraki). Museum of Contemporary Ceramic Art (Togeikan) in Shigaraki, Koka. The Museum of Modern Art, Shiga in Otsu (closed until 2020 for renovations). Sagawa Art Museum in Moriyama. Ogura Yuki (1895-2000), Nihonga painter, especially of Japanese women. Giant Gulliver statue outside JR Takashima Station. Woodcarving of Maibara at Maibara Station by woodcarvers in Kami-nyu, Maibara. Kamogawa 48 Stone Buddhas in Takashima. Originally made in 1553 by Sasaki Rokkaku Yoshikata. Kinomoto Jizo-in temple's giant Jizo statue. Statue of Tokaido Road travelers at Tsuchiyama Folk History Museum. Omi merchant statue in Gokasho, Higashi-Omi. Lady Murasaki Shikibu sculpture at Ishiyama-dera. "Pencil Tower" at University of Shiga Prefecture. Giant tanuki at Shigaraki Station. Yamauchi Kazutoyo and Chiyo statue at JR Sakata Station. Nagahama Hikiyama Matsuri stained glass mural at Nagahama Station's east exit. Toyotomi Hideyoshi glass mosaic at Nagahama Station's west exit. Sagicho float sculpture in Omi-Hachiman. Ninja interactive "trick" paintings inside JR Koka Station. Rice paddy art in northern Shiga (Maibara and Torahime). Seian University of Art and Design's outdoor art. Evening Bell at Miidera Temple. Evening Snow at Mt. Hira. At Otsu Port, why is this paddlewheel boat named "Michigan?" The boat was designed in Michigan. The wife of the boat's owner is from Michigan. The State of Michigan donated the boat to Shiga. Named after Shiga's sister state in the U.S.
"Michigan" sounds very American, reflecting the boat's classic design. Benten, seats 164 on two decks. Named after the goddess Benzaiten. Launched in 1983. Bianca, seats 458 as one of the lake's largest ships. "Bianca" means "white" in Italian. Launched in 1990. Ichiban Maru modeled after the original Ichiban Maru in the 19th century. Seats 100. River cruise on Setagawa River from Ishiyama-dera Port. Interlaken, seats 170 on two decks. Named after Otsu's sister city in Switzerland. Launched in 1981. Lansing, seats 46. Named after Otsu's sister city in Michigan. Launched in 1982. Maruko-bune, sailboat launched in Edo Period to mainly ship cargo across the lake. Megumi, seats 200. Upper deck is open-air and panoramic. Trimaran driven by biodiesel fuel engine and solar and wind power. "Megumi" means "blessings" and the ship's name refers to the blessings of Lake Biwa. Launched in 2009. Michigan, launched in 1982. Seats 787 on four decks. The lake's most famous ship with a paddlewheel and American crew members. Based in Otsu Port and named after the U.S. State of Michigan, Shiga's sister state. Rio Grande, seats 200 on two decks. Named after the Brazilian state of Rio Grande do Sul, Shiga's sister state. Launched in 1984. Waka-ayu ("Baby Sweetfish"), seats 100.
a training ship for Japanese Navy cadets. a training ship for lake navigators. a training ship for college students majoring in lake ecology. a training ship for fisheries students. for Shiga's 5th graders who go on overnight voyages to learn about the lake. Steller's sea eagle (migrates to northern Shiga for winter). bean goose (migrates to Shiga for winter). tundra swan (migrates to Shiga for winter). Essential habitat for wildlife like fish and birds (especially their young) to hide from predators. Modern development and land reclamation have drastically reduced reed beds, so Shiga is working to increase them. Reeds act like a filter cleaning the water. From January to March, withered reeds are harvested and used to make window screens, torches, and even flutes. The reeds are burned in summer to make way for new sprouts. Reeds sprout in April and grow to about 4 meters by summer. a pointer to the airport for airline pilots. a rack to cultivate seaweed. a rack to cultivate clams. a fish trap called "eri." an aquaculture farm to raise fish. Mt. Mikami (Omi-Fuji) in Yasu. A legendary giant man called Daidara-botchi dug up the ground to create Lake Biwa. What did he do with all that dirt? Created Mt. Ibuki in Maibara. Created Mt. Fuji in Shizuoka and Yamanashi Prefectures. Threw it up in the air which soon rained down as mud. Created the Noto Peninsula in Ishikawa Prefecture. Created Awaji island in Hyogo Prefecture. Created the Tottori Sand Dunes in Tottori Prefecture. When the legendary warrior-prince Yamato Takeru came to Shiga, what happened? From Seta-no-Karahashi Bridge in Otsu, he fought and killed a giant centipede on Mt. Mikami in Yasu. He used a giant sword to chop off the peak of Mt. Kanakuso-dake in Nagahama which then rolled into Lake Biwa and became Chikubushima island. He fell in love with a swan maiden bathing in Lake Yogo in Nagahama and married her, only to be later abandoned when she floated back to heaven. He stole Miidera Temple's bell and dragged it up Mt. Hiei in Otsu before throwing it back down. On Mt. Ibuki in Maibara, he fought an evil god disguised as a white boar who poisoned him with a mist. He wore a tanuki mask and started dancing on the street in Otsu and started the Otsu Matsuri. Honen (1133–1212), founder of the Jodo-shu sect. Kukai (Kobo-Daishi) (774–835), founder of the Shingon sect. Nichiren (1222–1282), founder of the Nichiren sect. Shinran (1173–1263), founder of the Jodo Shinshu sect. Gomura Betsuin in Torahime, Nagahama. Oda Nobunaga built and lived in which castle in Shiga? Odani Castle Castle in Nagahama. Toyotomi Hideyoshi built and lived in which castle in Shiga? Nakano (Hino) Castle in Hino. Azai Nagamasa and his daughter Chacha. Ishida Mitsunari (left) and his oldest son serving him tea. Oda Nobunaga being served water from Lake Biwa when he visited Nagahama. Ii Naomasa being served tea when he visited Nagahama. Toyotomi Hideyoshi (left) being served tea by a young Ishida Mitsunari when they first met at a temple in northern Shiga. Did Koka ninja really walk on water like this? During the Winter Siege of Osaka Castle in 1614, Ohatsu acted as an intermediary for peace between the Tokugawa and Toyotomi Clan. During the Summer Siege of Osaka Castle in 1615, the Tokugawa extinguished the Toyotomi Clan by forcing Yodo and her son Hideyori (fathered by Hideyoshi) to kill themselves in the castle. Go had Oda Nobunaga as an uncle, Toyotomi Hideyoshi as an adoptive guardian and father-in-law to daughter Senhime, Tokugawa Ieyasu as a father-in-law, son Iemitsu who became the third Tokugawa shogun, and granddaughter Okiko who became the reigning Empress Meisho of Japan. Go's grave is in Nagahama. In 2011, NHK TV broadcast its year-long Taiga Drama called Go–Himetachi no Sengoku (江〜姫たちの戦国〜) (“Go–Noble Ladies of Feudal Japan") featuring the Azai sisters, especially Go. Petting zoo to relax travelers stressed out from all that walking. Imasu-juku in Mino. (Shows the border between Imasu and Kashiwabara. There is an inn on the Imasu side [left] and Kashiwabara side. Chikubushima island in northern Lake Biwa. Hikone Castle (National Treasure) built by the Ii Clan in the 17th century. Hyakusaiji Temple grounds which had numerous priest residences in Higashi-Omi. Karasaki Shrine grounds in Otsu, famous for the huge Karasaki pine tree. Kusatsu Honjin lodge in Kusatsu where famous daimyo and other VIPs lodged as they traveled along the Tokaido or Nakasendo Road during the Edo Period. Lake Biwa Canal in Otsu built in 1890 to supply water from the lake to Kyoto. Tarumi Tongu in Tsuchiyama, Koka (垂水頓宮). One of five temporary palaces for the Saio princess to rest while traveling between Kyoto and the Saiku Palace in Ise during 886 to 1264. From age 17 to 32 (1832–1847), Naosuke lived in Umoregi-no-ya (open to the public), a reclusive house across the moat from Hikone Castle. He trained in tea ceremony, flower arrangement, Zen, poetry, martial arts, and other arts. Head of Ii Clan and daimyo of Hikone during 1850–1860. In 1858, appointed by the shogun as Chief Minister (Tairo) of the Tokugawa government. (Second-in-command next to the shogun.) Photo: Naosuke statue near Genkyuen Garden. In 1858, concluded the Treaty of Amity and Commerce with the U.S. (Commodore Perry) to open Yokohama and other ports to the U.S. Similar treaties with other countries followed. Died of pneumonia. Photo: Monument for Naosuke's poem at Hikone Castle. Depicted in the first NHK Taiga Drama in 1963 based on the novel "Hana no Shogai (Flowering Life 花の生涯)" by Funahashi Seiichi. Photo: Monument near Genkyuen Garden. There is a statue of him in Yokohama at Kamonyama Park near Sakuragicho Station. They were active during the mid- to late Edo Period and from mainly Omi-Hachiman, Gokasho, Toyosato, Hino, and Takashima. They traveled nationwide with a carrying pole to sell mainly fabrics, mosquito nets, tatami mat materials, medicines, lacquerware, and other products made in Shiga. Their business philosophy was called "Sanpo-yoshi" (三方よし) or "Good for me, good for you, and good for everyone." It means that their business activities must be good for the seller (profit-making), buyer (beneficial products at affordable prices), and society (business and cultural development) in general. Successful Omi merchants donated much money to shrines, temples, and public works projects to give back to the community. In Edo (Tokyo), many Omi merchants were concentrated in the Nihonbashi merchant district. Shirokiya, a major department store that was later absorbed by Tokyu, was founded by Omi merchant Omura Hikotaro in Nihonbashi in 1662. Most Omi merchants returned to Shiga upon retirement. Some of the grand homes of Omi merchants still exist and are open to the public especially in Omi-Hachiman, Hino, and Gokasho (Higashi-Omi). You can learn more about Omi merchants at the Ohmi Merchant Museum in Gokasho (Higashi-Omi) and Shiga University's Archives Museum in Hikone. Keihan Railways running between Osaka, Kyoto, and Shiga. Nippon Travel Agency, Japan's first travel agency. Omi Brotherhood, maker of Menturm chapsticks. Prince Hotels (Otsu Prince Hotel pictured). Seibu Department Stores (Ikebukuro Branch in Tokyo pictured). TORAY, a major textile maker. Yanmar, major maker of agricultural machinery. Former bank building in Imazu, Takashima, now the Imazu Vories Museum. Cable Enryakuji Station on Mt. Hiei that opened in 1927. Former Samegai Post Office, now the Samegai Museum in Samegai, Maibara. Former Minakuchi Public Library built in 1928 In Koka, now a gallery. Former Hachiman YMCA in Omi-Hachiman designed in 1907. Now the Andrews Memorial Hall. Former Toyosato Elementary School built in 1937. Former Hachiman Post Office in Omi-Hachiman built in 1921 and served as a post office until 1960. The Hyde Memorial Building at Omi Kyodaisha Gakuen (Omi Brotherhood Schools) in Omi-Hachiman. Built in 1931 to serve as Seiyuen Kindergarten run by Hitotsuyanagi Makiko, Vories' wife from 1919. Hachiman Commercial High School designed in 1935. Vories taught at this school when he arrived in 1905. The Lake Biwa Canal (Biwako Sosui) was built between Otsu and Kyoto in 1890 to supply water from Lake Biwa to Kyoto which was then revitalized with electric power and a stable water supply. A second and almost parallel Lake Biwa Canal was built in 1912 between Otsu and Kyoto to supply drinking water. Lake Biwa Canal in Otsu starts near Miidera Temple and is well-known for cherry blossoms in April. Water from the canal goes through the distinctive, red-brick Nanzenji Aqueduct in Kyoto. The Lake Biwa Canal Museum is in Shiga. Tourist boat service on the Canal between Otsu and Kyoto (Keage) will restart (first time since 1951) on March 29, 2018 on weekends until late Nov.
"Biwako Aika" (Lake Biwa Elegy, 琵琶湖哀歌), dedicated to 11 college rowers from Kanazawa and Kyoto who died when winds capsized their boat while rowing on Lake Biwa in 1941. "Biwako Shuko no Uta" (Lake Biwa Rowing Song, 琵琶湖周航の歌) about college rowers from Kyoto who rowed around the lake in 1917. "Goshu Ondo" (江州音頭), folk dance song originating in eastern Shiga. "Hiko-nyan Ondo" (ひこにゃん音頭), children's folksy song about Hikone's official mascot. "Kakekko-tobikko" (かけっことびっこ), the theme song we hear in Heiwado stores. "Suzuka Mago-uta" (Suzuka Packhorse Song, 鈴鹿馬子唄) about traveling over the Suzuka mountains on the Tokaido Road near Tsuchiyama, Koka. Chihayafuru (manga and anime) set at Omi Jingu Shrine in Otsu. K-On! (manga and anime) set at the old Toyosato Elementary School. Mascot characters (yuru-kyara or gotochi kyara) led by Hiko-nyan. NHK Taiga Drama TV series (like "Go: Hime-tachi no Sengoku"). Caffy, a Lake Biwa Giant Catfish. Shiga's sports mascot originally created for Sports Recreation Shiga 2008. Magnee, a Lake Biwa catfish and Shiga Lakestars pro basketball team mascot. Mitsunari-kun, modeled after Ishida Mitsunari as the official mascot of the Nagahama Sengoku Taiga Furusato-haku expo in 2012. Mori, another firefly from Moriyama. Ninjaemon ninja mascot from Koka. Ogoton from Ogoto Onsen hot spring in Otsu. Otsu Hikaru-kun from Otsu. Originally created to promote the 1000th anniversary of the novel "The Tale of Genji" (Genji Monogatari) in 2008. Sento-kun, a boy Buddhist monk with deer antlers. Tabi-maru. a traveler from Kusatsu which was a crossroads on the old Tokaido and Nakasendo Roads. Takumi Ponzan, a tanuki potter from Shigaraki. Turbo-kun modeled after pop singer and Shiga's Tourism Ambassador Takanori Nishikawa (T.M. Revolution). Mascot for Inazumi Rock Fes. Kita-Omi Resort in Nagahama (Takatsuki). Ota Yuki, foil fencer from Otsu and team silver medallist at the 2012 Summer Olympics. Kiryu Yoshihide, sprinter from Hikone and the first Japanese to run 100 meters in less than 10 seconds. Kimura Keiichi, Rio Paralympic medalist swimmer from Ritto. Kazuno Kenta, Rio Olympic badminton player from Otsu. Hayakawa Kenichi, Rio Olympic badminton player from Otsu.